Posted by Maggie the Moggie. January 29th 2016. Some cats like to claw and nibble at items inside the home. Fortunately, it’s a rare habit in adult cats but some kittens, while teething, like to gnaw at objects. This can be dangerous if your cat decides to chew on an electric power cable. 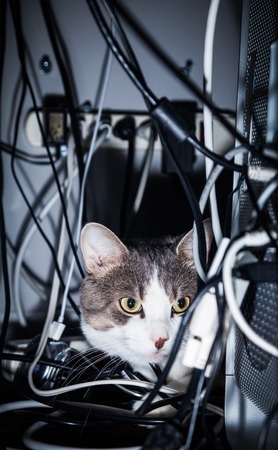 Keeping young cats away from cables can be tricky as the animals are small and can get into tight areas such as behind TV cabinets. Use cable-tidies that wrap around several cables. These not only keep them neat and out of the way, but they provide an extra layer of protection. Clip cables such as TV aerial inputs against a wall, so that your cat cannot get his or her jaw around them. Turn off electrical items at the main power source when not in use and overnight. Buy your cat teething toys that are, hopefully, more interesting than the wires in your home. It should be quite clear if your cat has suffered a shock. He or she maybe suffering a seizure but could be rigid or limp and unconscious. The first objective is to get your cat away from the source without harming yourself. Unplug the power before attempting to move your cat. If your cat is in water, use a non-conductive item such as a wooden pole. Wrap your cat in a towel and take him to a vet immediately. 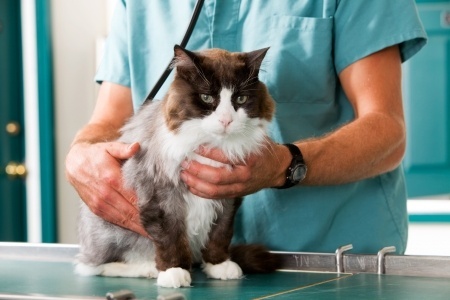 Your vet will check your cat’s heart rate and also his or her lungs. The vet will also look for any signs of burns caused by the electricity. Depending on the severity of the shock, your pet may have to stay with the vet. If you take your cat home, keep a close eye on him or her for a few days. One possible after effect is a build-up of fluid in your cat’s lungs. This might result in your cat struggling to breathe. If you notice this, then take him or her to the vet immediately. Also bear in mind, it is likely your cat will be traumatised by the event and may not be themselves for a while, so be sympathetic to this and let them take it easy.